Welltower (NYSE: WELL) has announced $1 billion in new off-market investments, involving 11 separate off-market senior housing and medical office transactions. In addition, an affiliate of Qatar Investment Authority (QIA) has made a $300 million investment in Welltower’s common stock and has an option to acquire an interest in a development pipeline of urban senior living communities. The newly announced acquisitions include four separate senior housing transactions totaling $725 million at a blended cap rate of 6.6%, Welltower announced Tuesday. Three of the transactions involve existing operating partners of the Toledo, Ohio-based real estate investment trust (REIT). The medical office acquisitions total $280 million in transaction volume at a blended cap rate of 5.9%. As part of the medical office investments, Welltower is under contract to acquire a 75% ownership stake in two MOBs under development in Charlotte, North Carolina. The buildings are set to be delivered in the second and third quarters of 2020 and are master-leased to Atrium Health; they are part of a health care-anchored mixed-use development next to Atrium’s Carolina’s Medical Center campus. Welltower is forming a joint venture with Charlotte-based real estate developer Pappas Properties as part of this transaction and is exploring further opportunities to expand the partnership with projects in the Southeast. Welltower’s new equity investor, QIA, is a sovereign wealth fund founded by the state of Qatar and based in Doha. It is known for some high-profile holdings in the U.K., including Harrods department store, Canary Wharf and a stake in Heathrow airport. QIA opened a New York City office in 2015. The arrangement with QIA came about after the wealth fund contacted Welltower months ago, according to Welltower CEO Tom DeRosa. QIA is also an investor in Empire State Realty Trust (NYSE: ESRT), for which DeRosa is a board member. QIA did not immediately respond to requests for comment from Senior Housing News. Also on Tuesday, Welltower announced two new board members: Karen DeSalvo, M.D., and Johnese Spisso, MPA. DeSalvo is a physician and professor in the Departments of Internal Medicine and Population Health at the University of Texas at Austin Dell Medical School. Spisso is president of UCLA Health, CEO of UCLA Hospital System, and Associate Vice Chancellor of UCLA Health Sciences. Like Welltower, other senior housing owners and operators have also recently formed new partnerships — including with overseas entities — with an eye on development. Singapore-based conglomerate Keppel is taking a 50% stake in Tucson, Arizona-based Watermark Retirement Communities. 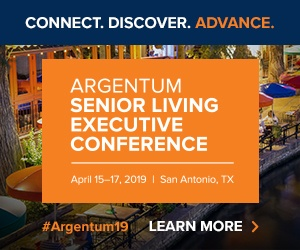 And Louisville, Kentucky-based Atria Senior Living is forging a joint venture with real estate developer Related Companies, targeting up to $3 billion in urban senior housing projects. While the REIT didn’t give much detail on the newly announced senior housing transactions during its investor day presentations, executives elaborated on the company’s overall plans, and they touted a few major moves undertaken earlier this year as indicative of the company’s larger strategy going forward. Management pointed to the conversion of 27 Brandywine Living properties from a triple-net lease to a RIDEA joint venture structure, and the company’s recent efforts to restructure its lease with Brookdale Senior Living’s (NYSE: BKD), as particularly significant. Today, Welltower’s Brookdale exposure sits at about 2.7% of net operating income (NOI), a far cry from the 7.3% NOI Brookdale generated in the second quarter of 2018. In paring down its Brookdale exposure, Welltower also forged closer ties with two operators that picked up the slack: Montreal-based senior living company Cogir, and newly formed operator Pegasus Senior Living, which is headquartered in Dallas. “On the senior housing front, 2018 exemplified our focus on driving value through relationships and aligned structures,” said Tim McHugh, Welltower’s senior vice president of corporate finance. Welltower has also been a proponent of urban development and recently announced that it will be embarking on a project in Manhattan, which will be its second in that New York City borough. In addition, the REIT made a big move this year by acquiring the troubled assets of skilled nursing giant HCR ManorCare in a joint venture with non-profit health system ProMedica in a 4.4 billion merger. While the deal had percolated for the past five to six years, what pushed the nonprofit over the edge was a desire to break down the barriers between care settings within a single network. And for Welltower, the overall idea is to align senior housing, post-acute, medical office and other types of real estate to help health systems and payers provide better services in lower-cost settings for residents and patients. Welltower’s share prices fell less than a percentage point Tuesday, ending the day at $72.13 per share.